Though it is a subject that doesn't seem to come up too much in casual conversation (a fact I personally find bizarre), it is fortunate that we live in a world where we can find out who would win a fight between the world's toughest sailer and a dinosaur. In fact, would a world without that information be one worth living in at all? I think not. 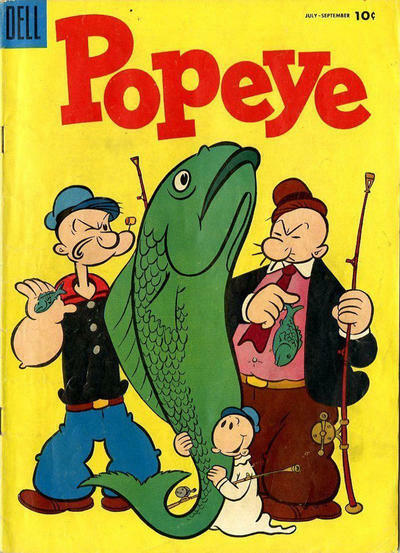 Dell Comics' Popeye #33 (July-September 1955) was published during a run that had Bud Sagendorf both writing and drawing the stories. Sagendorf's work on Popeye is brilliant--full of truly funny gags, great stories and wonderful art work. Popeye has had a lot of good writers recounting his adventures over the decades, but Sagendorf is the only one who rivals E.C. Segar as the perfect writer/artist for the character. "Monskers!" begins with Popey and Swee'Pea camping in the desert. Swee'Pea finds a small tunnel that leads into a hidden valley, where he's promptly menanced by a brontosaurus. Popeye crawls through the tunnel to rescue him, but the two end up trapped atop a mesa. Popeye's first attempt to deal with the dinosaur doesn't work out too well. But, fortunately, Swee'Pea remembers that he just happened to bring along a spinach sandwich. So Popeye powers up, but does not simply start punching out the brontosaurus. Because an important part of Popeye's character is his fair-mindedness and his compassion. Popeye gets into a lot of fights and often enjoys himself in the midst of a brawl, but he is never a bully and he never chooses to fight when he can make a friend instead. When writers such as Bud Sagendorf get this, Popeye rises above being a comedic character and becomes truly awesome. So Popeye gives the brontosaurus a good talking to and tries to tame him. Of course, the requirements of slapstick means this fails utterly. But it really is neat to see him try. Well, when a fight is indeed necessary, Popeye will indeed fight. And, powered up with spinach, he makes short work of the dinosaur. Which turns out not to be a dinosaur, but a robot about to be used to film a scene in a movie. So Popeye and Swee'Pea spend the night fixing the damage they had done. "Monskers!" is a great story, combining expertly choreographed slapstick with great dialogue and a keen understanding of who Popeye is. But then, we don't really find out what would happen if Popeye fought a dinosaur, do we? The dinosaur turns out to be a robot. That question actually is unanswered! Well, despite the doom, we will return next week with a look at the final part of the Avengers battle with Count Nefaria. 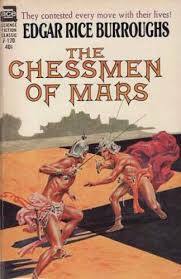 The latest episode of the Edgar Rice Burroughs podcast has posted. You can listen or download HERE. 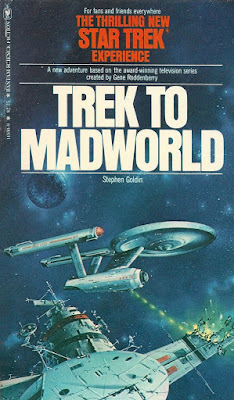 The early Star Trek novels had great covers. 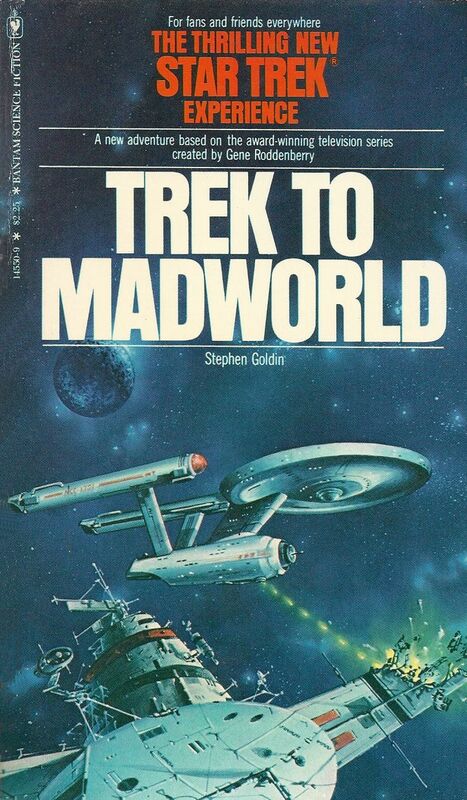 Sadly, the covers became more generic and less interesting as time went by. The first major battle of the Civil War is fought at Bull Run on July 21, 1861. The North expects an easy victory and a quick end of to the war. This is the third of 17 episodes from various series that will take us through the Civil War and its immediate post-war legacy. 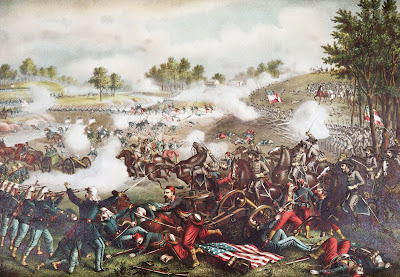 I'll be posting another Civil War episode every three or four weeks. 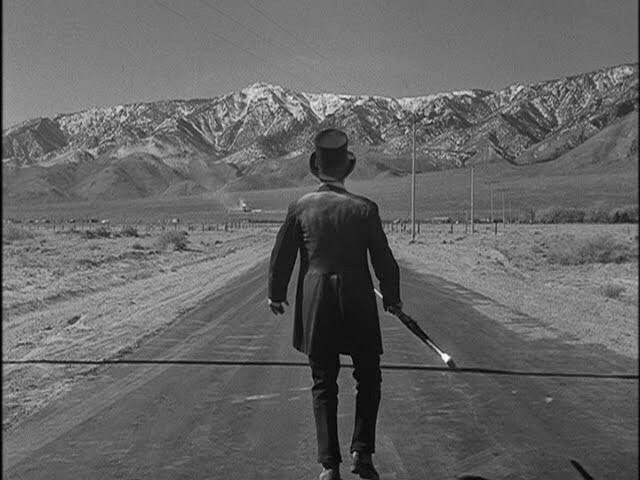 "A Hundred Yards over the Rim," which originally aired on April 7, 1961, is one of my favorite Twilight Zone episodes. The acting is great, the story is well-constructed, the dialogue sounds natural and the theme is just so darn human. Much like "Execution," it involves time travel, so only the beginning and ending are actually set in the Old West. And, as I type this, I realize I'm cheating on the theme of these blog posts. My idea was to cover the post-Civil War Western episodes of The Twilight Zone. This episode, though definitely Western-themed, starts and ends in 1847--well before the Civil War. I'll do the ethical thing and report myself to the National Board of Thematic Consistency of Bloggers. If this blog suddenly vanishes after this entry appears, you'll all know the punishment was particularly harsh. Anyway, we do start in 1847. Christian Horn (played by Cliff Robertson) is leading a wagon train from Ohio to California. But they are out of water and Horn's son is very, very sick. The other families want to turn back. Horn marches off to see what lies over a nearby rim, hoping to find something hopeful. What he finds is the year 1961. Horn has been mysteriously transported 114 years into the future. He's rather understandable freaked out by everything he sees, most notably by a truck that nearly runs him down. By the time he finds a small truck stop along the highway, he's thoroughly confused. The couple that runs the truck stop are played by John Crawford and Evans Evans. Though Robinson's performance as Horn really stands out in this episode, they add to it--letting us know from their own performances that they are two decent people who want to help out a man that they think must be a little nuts. They also treat a cut on his arm and he finds out what pennicillin is when they give him a couple of tablets to prevent any infection. When he's told what the drug does, you can almost see the wheels turning in his head when he thinks of his sick son. The pivotal moment of the episode comes when Horn looks in an encyclopedia and finds a listing for his son, who will grow up to be a doctor who does pioneering work in childhood illnesses. Suddenly, he's calm again. He's no longer confused. He understands almost nothing he sees here and he has no idea how he time-jumped, but now he knows he can take that small bottle of pills back with him and save his son's life. It's Robertson's performance with the simple theme of a father who loves his son that sells the episode. 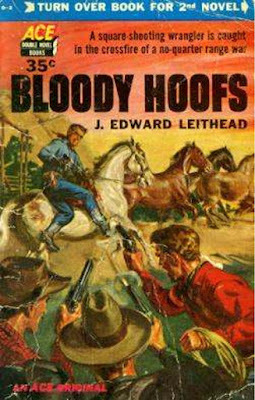 This is combined with a secondary theme of Horn learning that the hardships the wagon train has endured will payoff as they help bring civilization to a savage wilderness. 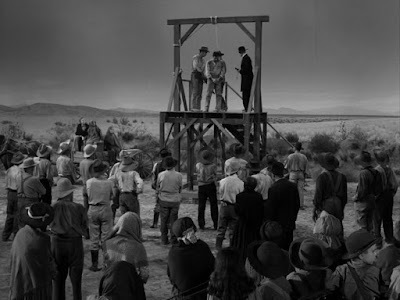 "A Hundred Yards Over the Rim" is character-driven in the way most classic TZ episodes are. The script is another one by Rod Serling, by the way. 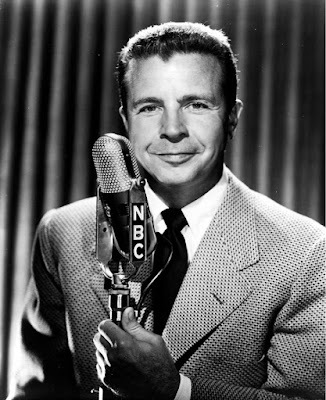 The hectic pace of TV production meant Serling would sometimes turn out a clunker, but when he was on his game, few writers could produce quality television on the same level as he. Avengers #165 (November 1977) picks up right where the previous issue leaves off. 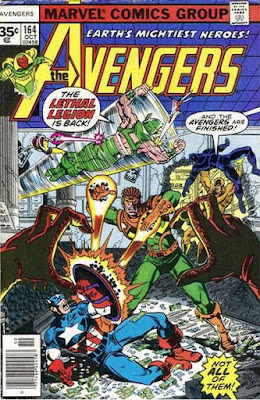 The Avengers have beaten the Lethal Legion, but Count Nefaria has used super-science to give himself powers--if this were the DC Universe, we'd be comparing him to Superman--and proceeds to curb stomp the Avengers. Writer Jim Shooter and artist John Byrne continue to give us expertly choreographed fight scenes, with the Avengers responding with courage and improvising what they hope will be effective tactics. But Nefaria is now simply too powerful. No matter what the Avengers try, he swats them aside. Eventually, he literally drops a 40-story tall building on them. Certain they must be dead, he wanders around New York, enjoying his new powers by causing havoc and gloating about it. But the Whizzer--the World War II speedster who had turned out to be the Scarlet Witch's dad (a plot twist later retconned away)--also tries to beat down the villain. He fails in terms of the physical fight, but manages to freak out Nefaria by pointing out that though Nefaria might be all-powerful, he's still a mere mortal. Eventually, he'll get old. In the meantime, Iron Man digs through the rubble to find the Avengers. It's no surprise to the readers that they survived, but it is nice that Shooter and Byrne explains that they used their powers in a way that makes sense in a Comic Book Universe to save themselves. Wanda and Yellowjacket used their powers to dig a foxhole while Power Man held up the rubble. In addition to Nefaria's sudden worries about his mortality, there's more effective character moments among the heroes at this point, as Iron Man insists on fighting Nefaria alone, while the other Avengers heatedly remind him they are a team. Nefaria then shows up, demanding to see Thor--the Avengers' resident immortal. The enusing fight scene is another great battle. Nefaria is winning again, but this time it takes more of an effort as Iron Man revs up the power in his suit. 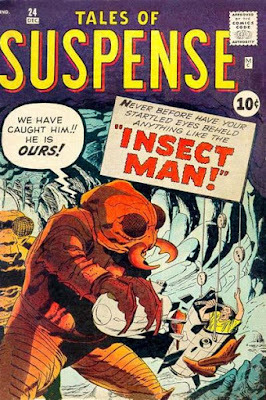 Yellowjacket runs off--obviously he has a plan, but we'll have to wait until the next issue to find out what that plan is. The issue ends on a visually and dramatically effective cliff-hanger, as Thor does show up. Is Nefaria powerful enough to stand up to the God of Thunder? We'll find out in two weeks. I continue to find this story arc effective and well-written. There's a strong plot, strong characterizations, great art and well-choreographed action. Next week--well, my blog has covered superheroes, World War II soldiers and pre-Columbian Indians fight dinosaurs. Now we'll see who well Popeye the Sailor measure up against a prehistoric beast. A dynamic Jack Kirby cover from 1961. A sneak thief is indeed guilty of petty theft, but is he also guilty of murder? It's up to Wolfe and Archie to find out. Science Fiction writers never really trust computers, do they? In 1966, while Captain Kirk was regularly using illogic to destroy dictatorial or genocidal computers, British writer Philip E. High was giving us the story of a computer that took charge of the world and ran it a bit too efficiently. 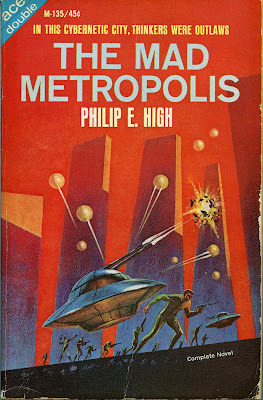 Mad Metropolis is set 400 years in the future, portraying a world that is in pretty poor shape. Billions of people are effectively out-of-work because mechanisation allows many jobs to be done more effectively than a human ever could. Button-sized devices called hypnads are commonly used, allowing people to create illusions that their bodies are youthful & good-looking and that drab, dirty buildings are beautiful skyscrapers. This has the effect of psychologically imprisoning everyone, stifling innovation and exploration. Everyone is crammed into cities in which the economy and society is on the verge of collapsing in on itself. A private security force called Nonpols are building up the equipment to stage a coup, but several of the cities' mayors put a plan into effect before that can happen. They've built a giant computer, programmed to benevolently take over production, supply and other economic necessities. Once the computer, called Mother, is activated, she immediately puts everyone asleep for nine days. When they wake up, she's now in charge. And, boy, is she ever in charge. She's a little bit nuts right from the get-go and now she sees it her duty to oversee every possible detail of everyone's lives. She controls diet, exercise--heck, she even starts matchmaking potential mates. She essentially keeps the human race in a prison environment and "adjusts" anyone who openly rebels so that they become slavishly devouted to her. Soon, Mother has accepted the idea that some humans must be killed to protect the majority. From here, the story spreads out to cover several divergent plot lines. The Nonpols have fled the cities and, working from secret bases, actively plan a military campaign againt Mother. A more idealistic group of geniuses called the Oracles also have a plan for taking down the computer. And a criminal syndicate, put out of business by Mother, are also working against her. The protagonist is Stephen Cook, a supposedly average guy who has a hidden potential to effectively be a super-genius. Working with the Oracles, he is the keystone for a plan to gradually drive Mother helplessly insane. But has Cook's intelligence is unlocked, he begins to see flaws in this plan. The end result would be a collapse of civilization perhaps worse than the one that was coming before Mother took charge. But, on the other hand, Mother can't be allowed to turn the human race into brainwashed zombies. So Cook has to come up with his own plan. He realizes that in order to save humanity, he might have to betray his comrades. 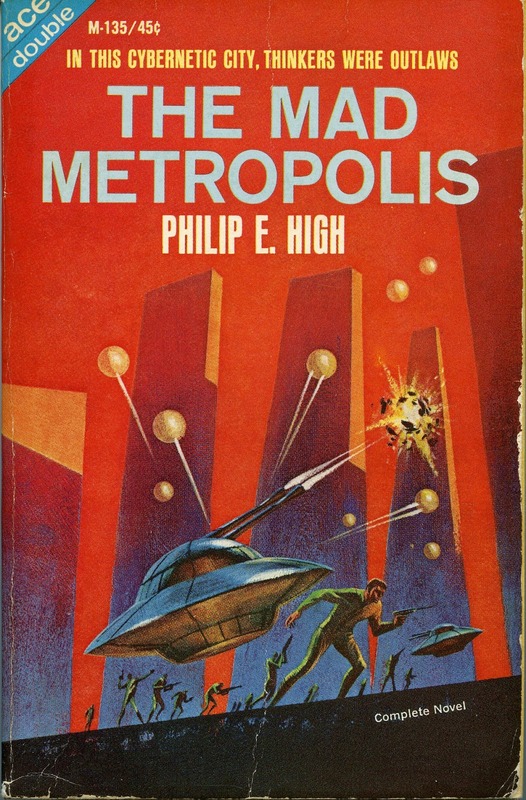 Mad Metropolis is a fun novel. The author creates an interesting society keyed on the existance of the hypnad and weapons that work by creating psychosomatic symptoms (essentially "death-wish" guns), then comes up with clever ways the various factions use this technology for their own ends. He weaves the various interlocking plot lines together effectively and drops in a number of diverse and interesting characters. The novel at first gives us a world in which humanity seems to have given up hope, but there are moments of heroism and courage throughout that allow it to end on a note of optimism. Seriously. DO NOT mess with Lone Tree's wife. It will not end well for you. 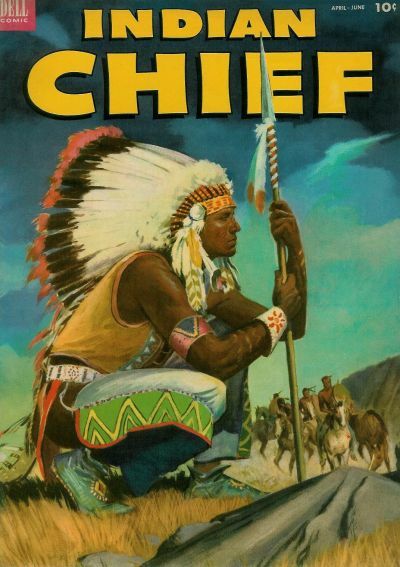 I've been reading through Dell's Indian Chief series (which ran for 33 issues from 1951 to 1959) and I have pretty much come to the conclusion that it is one of the finest comics ever produced. Each issue gives us two well-told and exciting tales that can be help up as near-perfect examples of how to meld good writing together with good art. It's really a pity that we often don't know who wrote a particular story. "Arrows of Fire," for instance, appeared in Indian Chief #10 (April-June 1953) and is a superbly told tale. We know the artist is almost certainly Jon Small, but we don't know who the writer is. If I had to guess, I would say the plot has a very Gaylord Dubois vibe to it, but that is indeed just a guess. The story jumps right into the action when Pawnee warriors attack a Kiowa village. They capture Yellow Bud, the wife of Lone Tree. That is the Pawnees' first mistake. If you want to live to see the next sunrise, the one thing you definitely don't do is threaten Lone Tree's wife. But when the Kiowa chief decides to send a war party directly after the Pawnee, Lone Tree wants to try a rescue attempt first, concerned that the Pawnee will kill Yellow Bud if they get cornered by a large war party. The chief, who is concerned with the tribe as a whole, vetoes this idea. So, though it weighs on Lone Tree's conscience, he lies about the trail he found to send his fellow warriors off in the wrong direction. The panel above is excellent, reflecting both Lone Tree's guilt over lying to his chief and his determination to save his wife no matter what. Lone Tree runs into trouble when he catches up with the Pawnee and has to hide in a hollow log, causing him a bit of discomfort when the enemy braves light a fire right next to that log! But he gets himself out of that situation and uses it as an opportunity to dispose of Yellow Bud's guard and run off with her. What follows are several pages of non-stop action as Lone Tree and Yellow Bud are closely pursued by the remaining Pawnee. Lone Tree uses every trick he can think of to stop those who threaten the woman he loves, including the particular brutal tactic of setting fire to some prairie grass to either burn the Pawnee to death or force them to jump off a cliff. A shifting wind spoils that plan and Lone Tree is soon making a last stand against the enemy. It looks like they are doomed in the end, but the Kiowa chief shows up with a rescue party in the nick of time and Lone Tree personally kills the Pawnee chief. Gee whiz, you really need to avoid messing with Lone Tree's wife! It turns out that the Kiowa chief knew Lone Tree was lying about the direction the Pawnee had taken, doubled back and followed him to the enemy. The chief isn't angry about the lie--he credits Lone Tree's love for his wife with giving the tribe their victory. It's a great story (available to read online HERE). Dell Comics during the 1950s gave us some of the best graphic storytelling in the history of the medium and "Arrows of Fire" is a prime example of why you can reasonably argue that Dell was the best comic publisher ever. 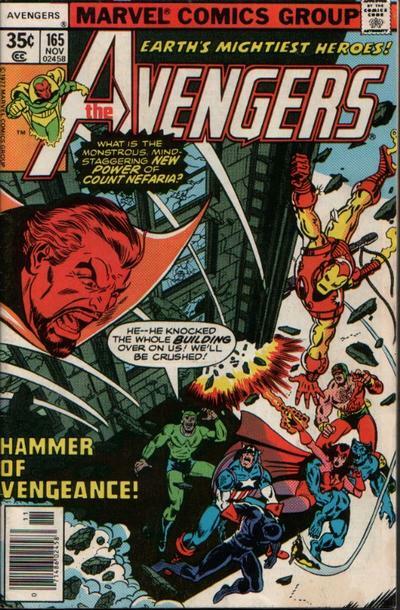 Next week, we return to the Avengers for a look at the second part of their battle with Count Nefaria. Ace Doubles were keepers as much for their wonderful covers as for their great stories. Diamond has less than an hour to either reason with a madman who can't be reasoned with--or disarm a bomb that can't be disarmed. 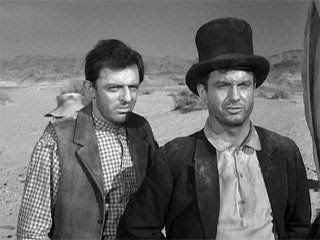 "Dust," which aired during The Twilight Zone's second season (January 6, 1961) was the show's third venture into the Old West. And, for the life of me, I can't figure out whether I like it. There's a lot to like. The story is set in a "misery-laden" and dying town, where there's no longer much food, money or work. A Mexican man named Gallagos is in jail, waiting to be hanged after he accidentally killed a young girl while he was drunk. The townspeople have allowed their daily despair to turn into hate and have made Gallagos the object of that hatred. A scummy peddler--who already sold the town the rope that will be used in the hanging--decides he can still make some money from it. He tells Gallagos' father that he has a bag of magic dust. Scattered into the wind, it will turn hate to love and inspire the people to spare Gallagos' life. The peddler is a con man and the dust is just dust. But this is The Twilight Zone, after all, so when the desperate father does toss the dust into the air, you know something is going to happen. 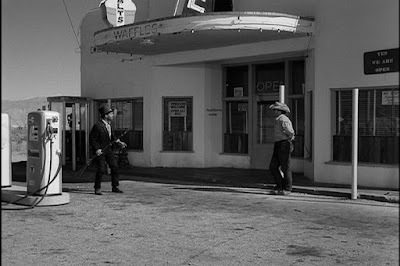 The production design is excellent, really bringing across the feeling that the town is dying. The actors, especially Thomas Gomez as the peddler and John Larch as the sheriff, are all very good. Some of the dialogue can be seen as a little heavy-handed, but each line fits the personality of the character delivering it, so none of it sounds forced. And, as far as it goes, the moral of the tale--dealing with the importance of showing mercy--is one that, as a Christian, I fully appreciate. But--perhaps because the story had to fit into a 30-minute time slot--there's not enough time to talk about the concept of justice. Gallagos did run over and kill a child with a wagon while he was drunk. He's in jail and sentenced to death because he actually is guilty. That's where the episode falls a little short for me. There needed to be more discussion about Gallagos' guilt and what constitutes appropriate justice for his crime. Personal forgiveness of those who wrong us, even when that wrong involves the death of a loved one, is important and the episode deals with that concept with sincerity. But civilization can only exist if there is justice meted out to those who commit crimes Personal forgiveness does not have to include setting this concept aside. If someone kills, robs or rapes, the victim benefits both from looking to God for the strength to forgive AND knowing the criminal will be dealt according to the rule of law. The two concepts are not mutually exclusive. "Dust" gives us an ending that was too pat after setting up a situation where these concepts could have been dealt with in a more sophisticated way. 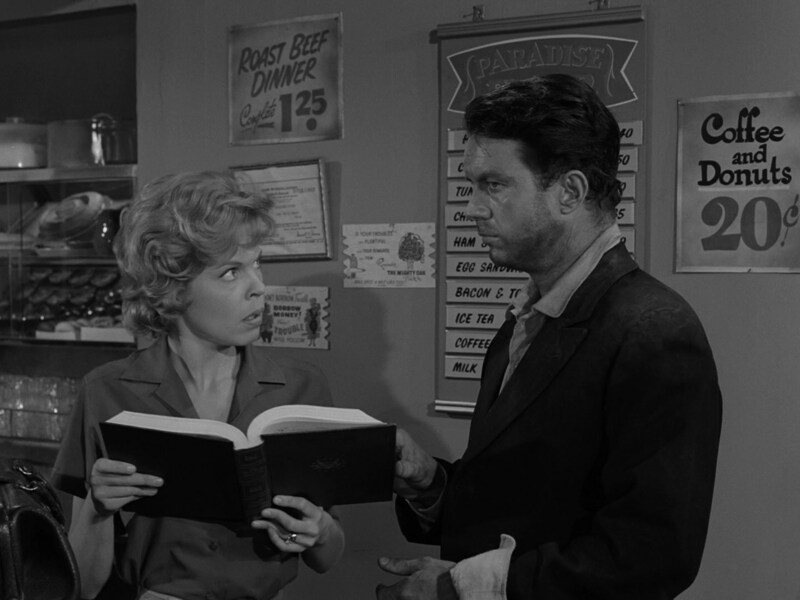 The script is by Rod Serling, one of the best writers that ever worked in television. 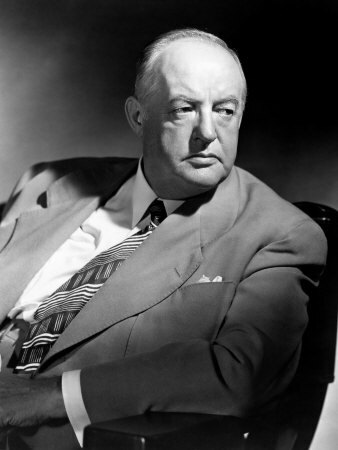 He was quite capable of giving us a script that would have intelligently debated the balance between mercy and justice. It's too bad he didn't quite get there. 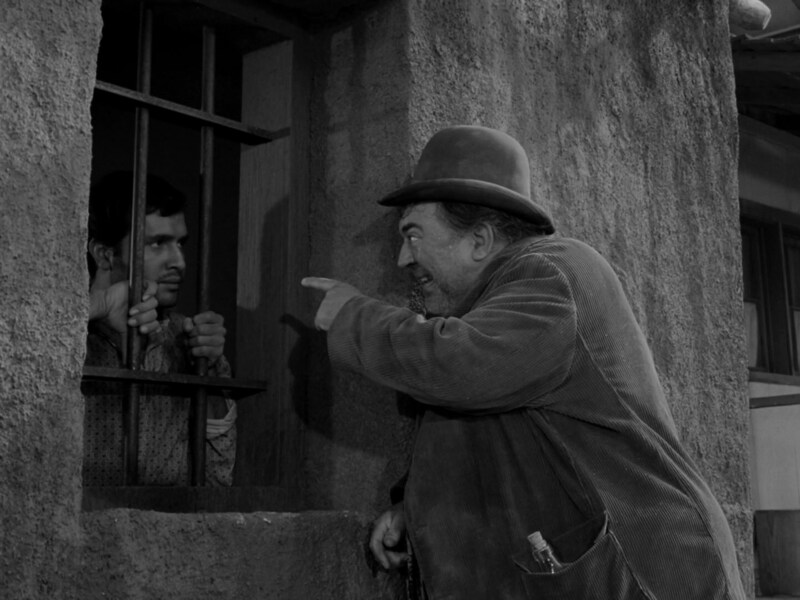 On a side not, three of the eight Old West-themed TZ episodes involve peddlers as important characters. There is almost certainly no actual significance to that, but there you go. 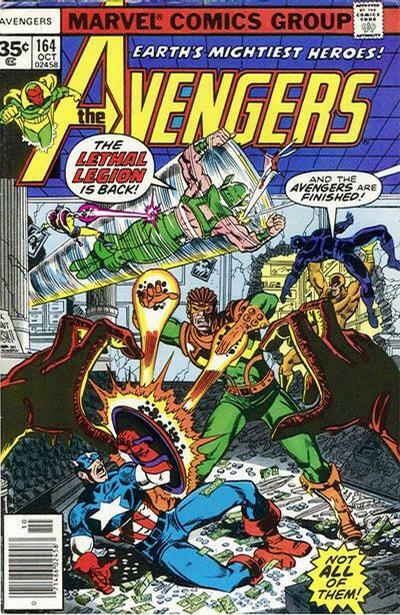 Avengers #164 (October 1977) is the beginning of a very entertaining trilogy. Written by Jim Shooter and drawn by John Byrne, it gives us a strong plot and excellent action scenes while also providing us with some really strong character moments. I've always considered Count Nefaria to be a sort of second-stringer, but I don't mean that in a bad way. Both Marvel and DC have their major villains--Dr. Doom, the Red Skull, Lex Luthor, Joker, etc.--that play an important role in defining their heroic arch-nemeses. But both Universes are also filled with villains who are less important on a personal level to the heroes they fight. But they are still perfectly viable characters who can be used effectively in a well-written story. That's what happens here with Count Neferia. He has no superpowers, depending on his brains and/or his minions to carry out his evil schemes. But at this point he's been beaten by the Avengers, Iron Man and the X-Men, so he's pretty much broke. 3. Re-hire some former Nazi scientists who used to work for him. 4. Use the scientists to temporarily amp up the power of the villains. 5. Double-cross the villains to get them out of the way. 6. Have the scientists permenantly amp him up with superpowers. According to the logic of a Comic Book Universe, this is a perfectly sound plan. Neferia recruits Power Man (the evil one--not Luke Cage), Living Laser and Whirlwind. He then has them blow a bank. I really enjoy the short but effective fight scene that follows. Captain America has a plan and the Avengers follow it, but Black Panther doesn't quite manage to take down Whirlwind and the bad guys are able to get away with the money. 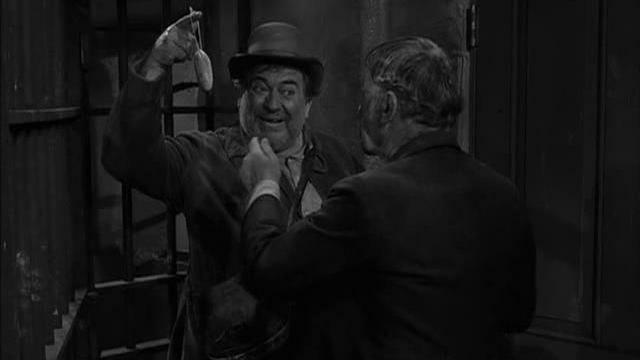 This is followed by a scene at the villain hide-out--another sequence I enjoy enormously. The petty arguements, jealousies and greed exhibited by supervillains and the scientists mark them for what they are--cheap crooks despite their power or their skills. The scene contains some key exposition, but much of the characterization here isn't essential to the plot. But Shooter includes this because these insights into the various characters draw us farther and more effectively into the story. I know Shooter's tenure as editor at Marvel has its detractors, but he was a good writer. Despite the internal bickering, the scientists do amp up the powers of the supervillains. Looking for revenge against the Avengers, they attack the Mansion, beginning their assault when Power Man tosses a car throught he window, knocking out Wasp. What follows is another fun fight scene, with the amped-up villains at first getting in some licks and giving a newly resurrected Wonder Man a crisis of confidence. But when their new powers suddenly fail, they collapse. And this, of course, is the culmination of Nefaria's plans. He didn't need his minions anymore, so he had them attack the Avengers as the most convenient way of getting them out of his hair. Now he shows up with his own new powers to take his own revenge against the heroes. As I said above, this is a strong beginning to an entertaining trilogy. We'll return in two weeks to take a look at the second part of the story. Next week, though, we'll join a pre-Columbian Indian tribe as we learn that you simply DON'T mess with a warrior's wife.